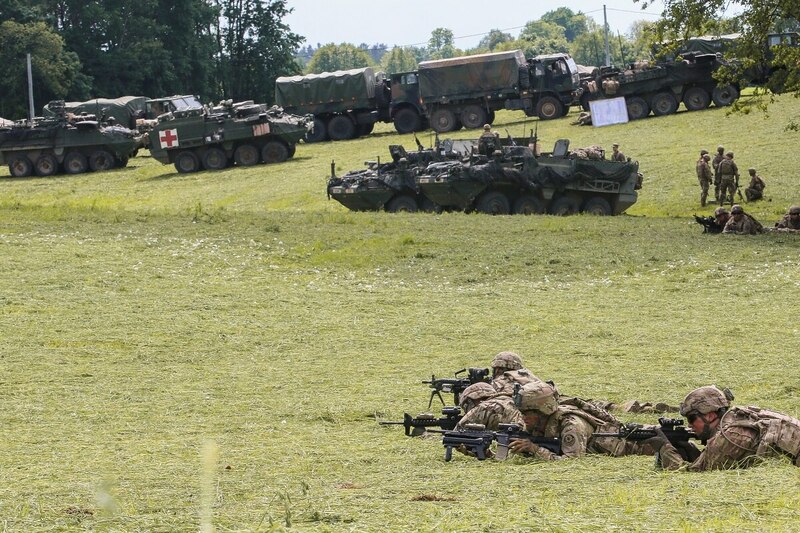 WARSAW, Poland — The Polish Ministry of Defence has offered the U.S. financial support in the range of $1.5 billion to $2 billion for the deployment of a permanent U.S. armored division in Poland, according to a ministry proposal. “The decisions on this matter are moving in a good direction,” Blaszczak said, as quoted in a ministry statement. The document, titled “Proposal for a U.S. Permanent Presence in Poland,” was obtained by local news site Onet.pl, which first broke the news. It was distributed to U.S. government institutions, Congress and some of the leading U.S. think tanks, according to information obtained from the ministry. Although conceding that the relationship is priceless to Britain, the defense secretary did offer an amount. “The Government of Poland will offer significant funding for this action … as it is important to share the burden of defense spending, make the decision more cost-effective for the U.S. Government, and allay any concerns for Congress in uncertain budgetary times,” the document states. "This proposal seems rational because the U.S. administration has been sending signals that it wants its European allies to take over a larger share of the financial burden for NATO’s strengthened presence in this part of Europe," Tomasz Smura, the head of the research office of the Warsaw-based think tank Casimir Pulaski Foundation, told Defense News. The move is likely to trigger a bellicose reaction by Russia, which has opposed various initiatives to expand U.S. military presence in Eastern Europe. In 2014, Moscow launched a military intervention in Poland’s neighbor Ukraine. Since then, Russia has occupied parts of the country, including the Crimean Peninsula. As a result, numerous member states from the region have called on NATO to deploy additional troops to Eastern Europe amid increased concern over potential Russian aggression. Poland has also intensified efforts to upgrade its defense capabilities. On March 28, Warsaw signed a letter of offer and acceptance with the U.S. to acquire Raytheon’s medium-range Patriot system. The acquisition, developed under the Wisla program, is worth $4.75 billion, according to the ministry. The purchase will consume a large portion of the country’s military expenditure, as for 2018, the ministry forecasts defense spending of 41.5 billion zloty (U.S. $11.2 billion). Łukasz Kister, an independent security analyst with the Jagiellonian Institute, a Warsaw-based think tank, told Defense News it is good that Poland’s authorities are willing to safeguard Poland’s security by various means, but that co-financing the deployment of U.S. troops on Polish soil could jeopardize the country’s military modernization program. According to the analyst, Polish authorities should put emphasis on industrial cooperation between U.S. and Polish defense manufacturers and ensure the transfer of knowledge to local plants. “Poland cannot afford highly offensive military capabilities, and the U.S. is definitely a key partner with whom we should cooperate. But this cooperation should be placed at a different level. We should pay the U.S. for top technologies, know-how, gear and training, and not for the deployment of troops,” Kister said.